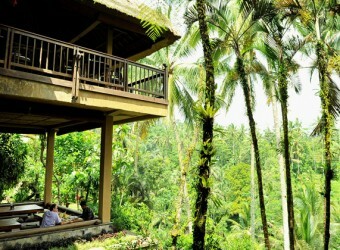 Bali Restaurant Kampung Cafe is located at Tegallalang overlooking beautiful rice terrace scenery, outside Ubud. This long-established café has cottages where you can enjoy the beautiful nature scenery. The café built surrounded by high palm trees, a tranquil place. The Café provides Indonesian food at affordable price.1st floor is zaseki seats. You can relax while enjoying delicious Indonesian food. This café is located in the middle of nature. It`s a nice place for tea time. I went there after lunch and I was impressed by the nature around the café. This café offers a variety of desserts, I had the dessert on the second floor. I had dessert that`s like fruit punch in Japan, sweet and nice.